Life's too short for boring chairs! Many, many years ago I loved the movie When A Man Loves A Women. Partly because it was a Meg Ryan flick and I was a huge fan but also because I loved the house they lived in. Silly to love a movie based on the props and home decor, but it's true, I did. Specifically I loved their dining room table. It was beat up with a reclaimed wood top, and that was waaaaay back in the early 90's long before using reclaimed wood was the trend. The table was cool but the best part? 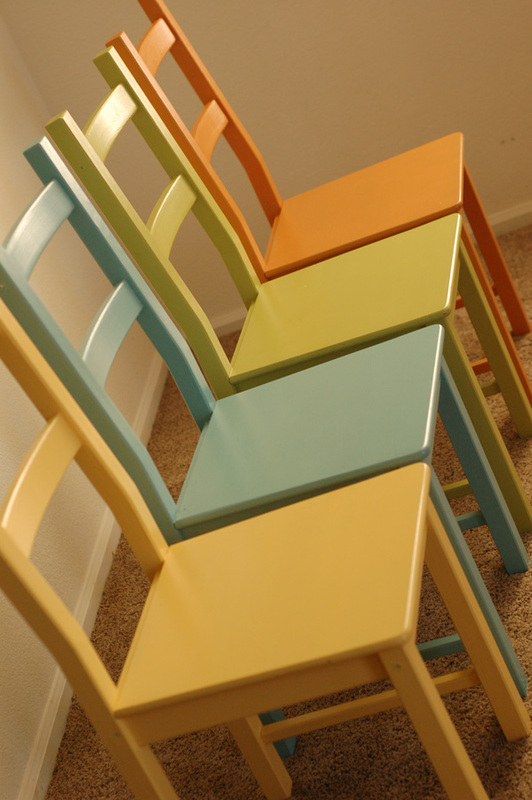 It had several different colored chairs surrounding it - I was in love and I knew someday I'd have my own version of that. I still haven't found the table. Kent's been drawing up plans and we will eventually build one but until then, I can celebrate that I do have my chairs and I love them. They make me smile. 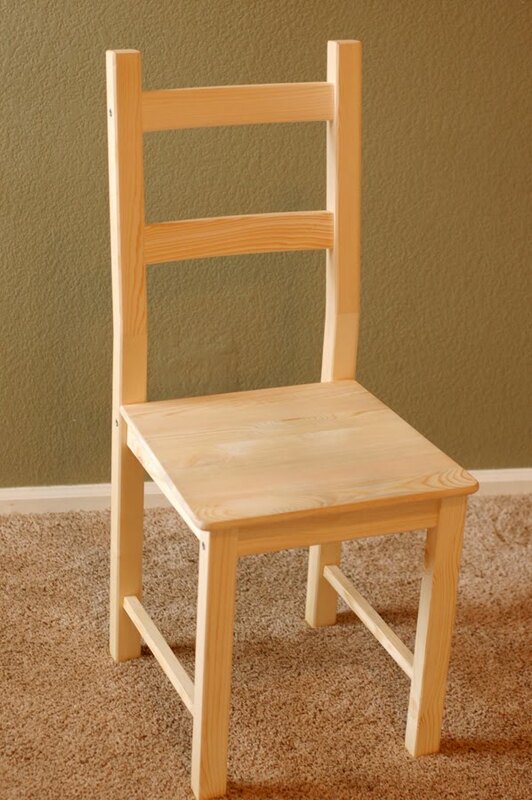 I found the basic chair at Ikea for way cheap, like $20 bucks cheap, and I had to have them. Here's one in it's naked form (gasp! how immodest!) I really like simple, no frills, furniture. If it's decorative, Victorian, or traditional, it's really not for me so when I saw these chairs, they were perfect. Once we got them home, I took a few trips to Lowe's for paint chips and settled pretty quickly on the colors shown above. This summer I've developed this weird love affair with the color orange - I've always hated orange so I'm not sure why I changed. Perhaps color preferences are like taste buds and they change every 7 years. hmmm? Maybe. Anyway, the girls really wanted purple too but I just couldn't do it, maybe a plum, but purple? ummm, NO! The really great thing about Lowe's is that Valspar paint has test samples that you can buy for about $3. They will mix it any color you like, which is awesome. Plus, it was the perfect amount of paint and the perfect price. 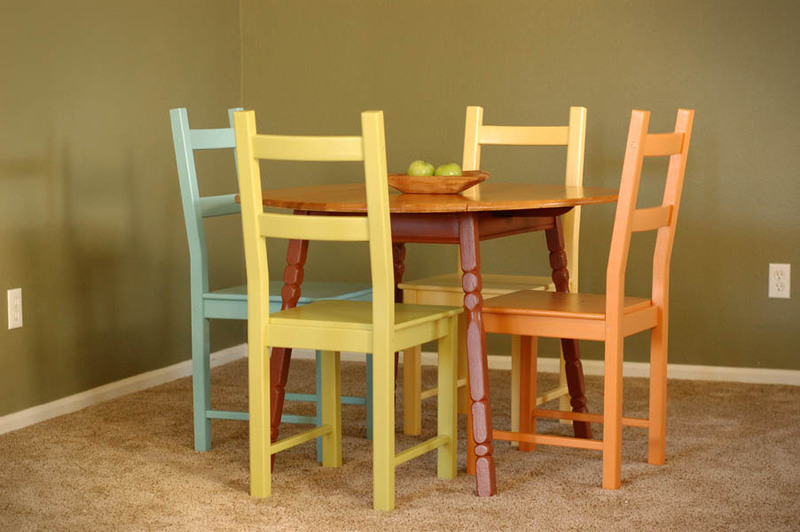 In the future I will make some colorful chair pads and I may even add a glaze and distress them a bit but for now, we are just enjoying the fact that we are no longer using metal folding chairs and that the colors add some fun to our dinnertime routine. And that is what I made over my summer vacation. p.s. - This table isn't bad. It's a family heirloom and once I cleaned it up and repainted the base, it looks ok. I like thinking about all the people in my family, some I didn't even know like my grandpa, who have eaten their meals and played games around this table. It's a hundred years old so that is pretty cool. However, it will eventually be moved to a different spot in our home and replaced to make way for my reclaimed wood creation. Can't wait! 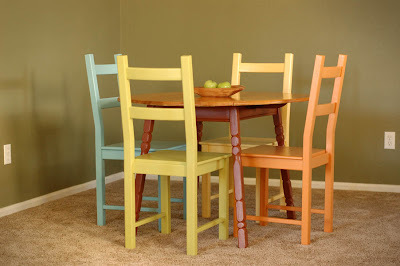 We are wanting to do something similar to our dining room chairs, thanks for the inspiration! Coming from Be Different Act Normal! Beautiful. Fun. I want to eat at a table with those chairs! I can see this is a project in my future! And I'll be watching the movie soon. I love Meg Ryan and have never seen this movie. Thanks for both ideas. I loved that movie (and the little girls in that movie...heartbreaking!) but I don't remember the table or chairs. So now I am going to have to rent it and take a look. I am a HUGE fan of mismatched chairs! Thanks for sharing I LOVE this show and tell. Oh my goodness, what a great color combo. 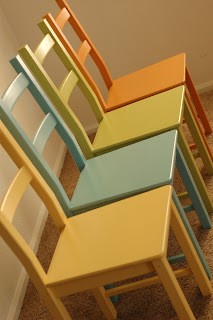 I love the chairs as well (I too am a big fan of simple) and I can not get over how wonderful they look in those colors. Fabulous job! I love the idea and how yours turned out! Do you girls fight over who gets to sit in what color? I could see that happening at my house, but I may do something like that anyway! I am finding the older I get the more open to things I used to "hate". Orange is actually a good color to have in the dinning room. It inspires conversation and isn't as overwhelming as red.